2016: Nominated for IM Division GWU-CIBER Best Paper on Emerging Markets, Academy of Management, Anaheim. 2016: Nominated for IM Division HKUST Best Paper in Global Strategy, Academy of Management, Anaheim. 2016: Best Reviewer Award, Academy of International Business, New Orleans. 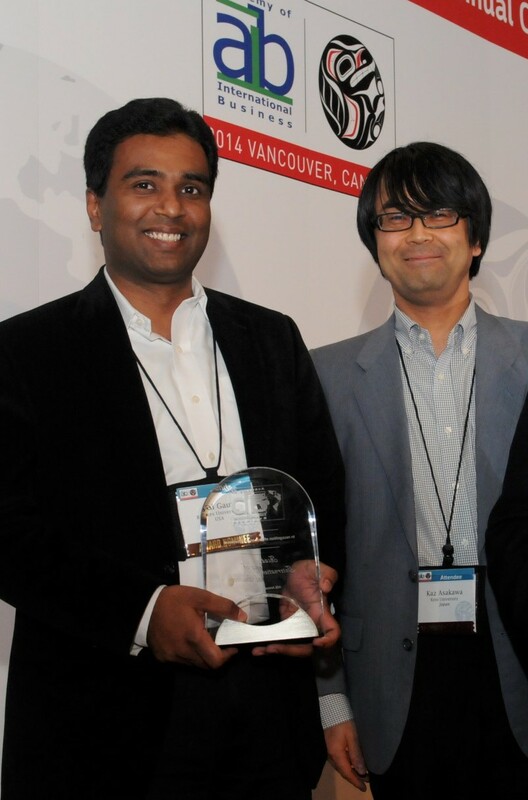 2014: Winner, Temple/AIB Best Paper Award, Academy of International Business, Vancouver. 2014: Nominated for IM Division GWU-CIEBER Best Paper Award, Academy of Management, Philadelphia. 2014: Nominated for Junior Faculty Research Award by the Department of Management and Global Business, Rutgers Business School. 2013: Nominated for IM Division Best Paper Award, Academy of Management, Orlando. 2012: Winner, Junior Faculty Research Award, Rutgers Business School. 2012: Nominated for the Best Conference Paper Award at the SMS Annual Conference, Prague. 2010: Nominated for Junior Faculty Research Award by the Department of Management and Global Business, Rutgers Business School. 2009: Finalist, Gunnar Hedlund Best Dissertation Award, Stockholm School of Economics and European Academy of International Business. 2008: Winner, Richard N. Farmer Best Dissertation Award, Academy of International Business, Milan. 2006: Winner, SAMS/AIB Best Doctoral Dissertation Proposal Award, Academy of International Business, Beijing. 2005: Nominated for Carolyn Dexter Best Paper Award, Academy of Management, Hawaii. 2005: Finalist, IM Division Best Paper Award, Academy of Management, Hawaii. 2005: Nominated for the Best Conference Paper Award at the SMS Annual Conference, Florida. Such a huge and rich list of awards ! Commendable Sir !